On this date in our family history . . . the 18th day of June . . . in the year 1935 . . . which would have been her 53rd birthday . . . Emma Patience Muston nee Nettles was probably remembering with fondness the gathering on the previous Sentimental Sunday which was held in honor of her upcoming "natal day" . . . the report of that birthday celebration is copied below . 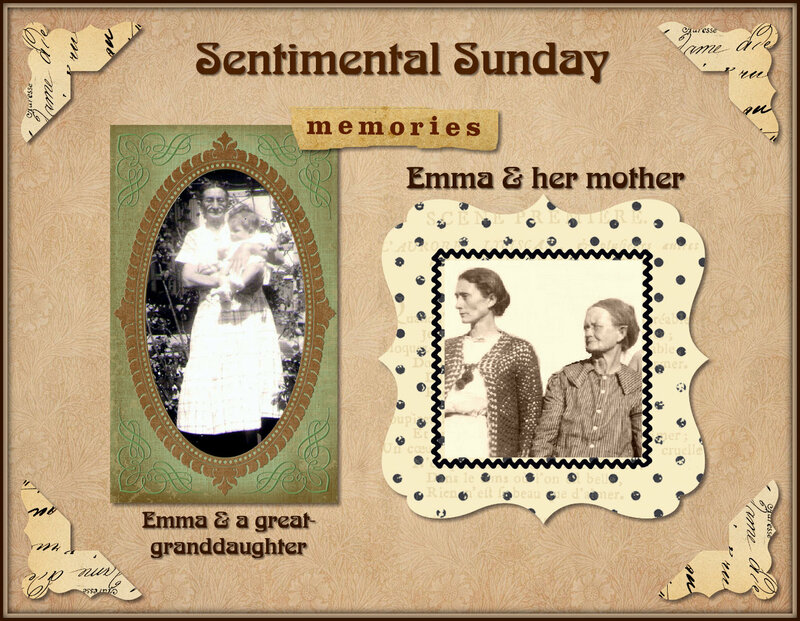 . . this Emma is the paternal great-grandma of the Keeper of this family history blog (who is being held by Emma in the following heritage collage) . . .
Cole Springs, June. 17. -- Mr. and Mrs. B. Hickman and children, of Austin, spent the week end with their parents, Mr. and Mrs. F.F. Moore, the occasion being the natal day of Mrs. Emma Muston. Her daughters entertained in her honor Sunday, June 16, at the Muston home. The date falling upon Father's Day seemed fitting as Mrs. Muston has been both father and mother to her family. She was left a widow by the death of her husband with seven little girls, the youngest a tiny infant. By frugality and perseverance she has reared this family, giving them both school and social advantages. She is one of the fortunate mothers who enjoy the complete devotion of her children as they are constantly planning to make life fuller and sweeter for her. A beautiful cake decorated with fifty three candles, adorned the festal board, which contained an abundance of choice viands. Mr. and Mrs. Ben Beynolds of Houston were unable to attend. Mrs. Muston's mother, Mrs. M.A. Nettles, a brother, J.A. Nettles, wife and daughter, Carrie Belle of Lexington, and Mr. John Taylor were the other guests who attended.